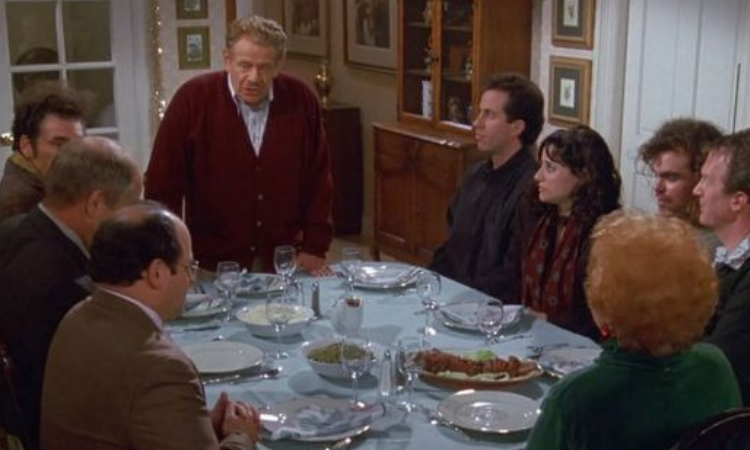 If you’re a fan of Seinfeld, you likely know of a little holiday called Festivus and one of its annual traditions called the Airing of Grievances. We’re taking the opportunity to air some grievances about college gymnastics and start 2019 with a clean slate of frustrations. Don’t agree with some of our gripes? Chances are high that’s the case. If so, let us know in the comments some of the things you’re not particularly fond of before turning the page and sitting down to enjoy the sport you love come January. And by that I mean you judges and by you judges I basically mean Carol. There’s a lot of talk about ridiculous scores in this day and age of NCAA gymnastics. Whether it’s an imperfect 10 or a routine with a big mistake that still somehow scores a 9.700, it seems like more often than not a meet is riddled with controversy stemming from the evaluating of routines. And I’m someone that likes to get to the root of the problem: the judges. 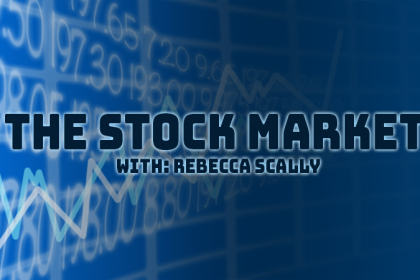 Now bear with me now because I’m going to suggest something outlandish and off-the-charts crazy. Are you ready? What if—stick with me—the judges took all the deductions in the code that they were supposed to take? No, really. I’m being serious! Yes, seriously! This point is kind of contradicts my first grievance in a way, but hang on for a second. I’d like to start with a personal story. I obviously love college gym. I mean, I started a whole website dedicated to it. But I’ve gotten to the point where I can’t look at social media during a competition or my enjoyment level dives down to about three percent. To me, it just seems like all the gymternet ever does anymore is go from one complaint to the next. Or maybe that’s just what people are posting on Twitter. Either way, I find I enjoy the meets much more when I unplug from social media. The world is negative enough as is, don’t let your favorite hobbies become black holes of despair too. Yes, I do realize I’m making this request in a post literally about all the things we hate in college gym… The irony is not lost on me. Let me clarify the header. Having a bias toward a team or gymnastics is totally fine. It’s just when bias clouds all reason that my blood temperature starts to head toward its boiling point. Maybe it’s the journalist in me. Maybe it’s more when people don’t realize they’re biased. But biases is essentially innate human behavior; you can’t escape it no matter how hard you try, so recognizing your biases is the first step to acceptance. Or something like that. If you haven’t noticed, regionals session times are posted on three of the four host teams’ schedules, and spoiler: Thursday’s Don’t-Call-It-A-Play-In play-in is at 3 p.m. on a Thursday. Yes, really. Are they expecting anyone but the gymnasts’ parents and maybe some other non-competing teams to be there? Heck, I wouldn’t be surprised if even Mom and Dad and a couple of judges failed to show up with a start time like that. Sure, I get the need to have the first day of competition on a Thursday in case a team like BYU, which “can’t” compete on Sundays, makes the final round, but in what way does growing the fanbase of a sport mean having a meet in the middle of the afternoon on a weekday? At least have it at a time after normal people get off work. Honestly. The Big Ten is one of the Big Four conferences, with the SEC, Pac-12, and Big 12. If you’ve watched meets on any SECN or Pac-12 Network properties, you know how amazing they are. On those networks, you’re treated to commentators like Kathy Johnson Clarke, Bart Conner, Jim Watson, Sam Peszek and Amanda Borden. You get the SEC protractor. You get high-quality production with multiple cameras and sideline reporters. It is comparatively very difficult to watch the Big Ten and Big 12. When you do catch the Big 12, if you get FSOK or Altitude Sports, the coverage is strong, but since the conference doesn’t have a network with deals with Sling or YouTube with Live TV, it can be harder to track down all the meets. Conversely, BTN and BTN+ do a good job of providing coverage to a variety of Big Ten meets, and the BTN and FloGymnastics partnership makes those meets more widely available. That said, the coverage pales in comparison to other conferences. YouTube live streams of EAGL meets are easier to follow than the one camera, no commentary BTN+ meets (thank you EAGL!). BTN meets with commentary are stronger, but still nothing compared to Friday Night Heights. The Big Ten is full of exciting, dynamic gymnastics. It is high time that the coverage got better, so the conference can grow its audience. Imagine tuning into a college football or basketball game—at any collegiate level—and there being no scores at all. It would never happen. Yet in 2018 there was a major gymnastics invitational with no scoring at all. Team’s SIDs are left trying to tweet scores, and fans turn up the volume to hear if they’re announced in the arena. This is absurd. It’s one thing if the only coverage of a meet is a YouTube live video, and the live score link we’re all familiar with is a little glitchy. But any major meet, especially one with more advanced coverage, needs to have scoring that works. It is an insult to the sport to provide no real way to follow the action. If gymnastics is going to be taken seriously, it’s an issue that needs to be resolved. I think we all agree that gymnasts deserve their privacy and have a right not to have specifics of an injury disclosed if they don’t want. But when gymnasts mysteriously vanish off rosters with no explanation or don’t compete for an entire season for no obvious reason, it is incredibly frustrating. OK… Clearly this is mainly a photographer gripe and the rest of the gymternet probably doesn’t notice or really care, but postseason meets in particular have this tendency to have rather large potted plants. Everywhere. But in particular, placed directly in front of the boxes where the photographers are required to stand. While outdoor and location shoots are definitely an “in” thing in gymnastics photography right now, I could do without the plants cutting off body parts when I’m shooting a meet. 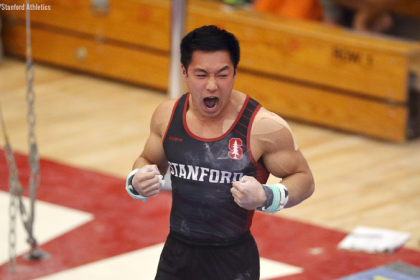 We’ve been through it a million times: A Kyla Ross/Ivy Lu bar routine is actually more difficult than the Jaeger + overshoot, blind full + double back routine that most of Division I does, and I’m sick of the lack of same bar release being held against some of the best bar routines in the country. We’d all love it if everyone could be Elizabeth Price or Peng-Peng Lee and throw multiple D/E releases and a D dismount in every bar routine, but it’s not reasonable to demand that of everyone. So why do we keep pretending that same-bar releases make or break a bar routine? It doesn’t make any sense to elevate one kind of skill over the others, and I think in most cases it amounts to an expectation that former elites throw more difficulty than the population at large. 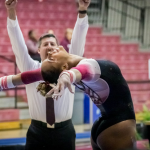 As much as we all love high-octane bar routines that surpass NCAA requirements, how can we resent gymnasts who are playing by the rules and doing what they have to to preserve their bodies, while still throwing three or four D-plus skills? Some meet themes are unique and important, like UNC’s annual Diversity & Inclusion Meet. Some, like the yearly Auburn meet where fans get in free if they’re shorter than head coach Jeff Graba, are hilarious. 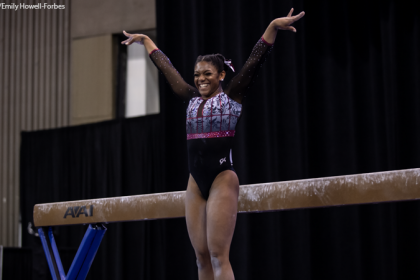 Some raise money and awareness for important causes, and I can even get behind the Pink Meet tradition just because it brings new leotards into circulation. But really, does EVERY home meet need to have a theme? Attending a lot of meets in person (I know, I shouldn’t be complaining) they can really start to grate, especially when the meet does no meaningful good, and all the “theme” amounts to is prerecorded video segments playing on the megatron between rotations. New team challenge: have one meet per year that’s just…normal. For adherents of our Leotard Rankings series this will not be new information, but I CANNOT handle writing on leotards. A team name quietly placed on a back band in the style of Cal or a small logo over one hip is fine. Things that are not fine include leotards where the primary feature is the school initials or logo blown up huge on the chest, leotards with the team name or mascot scrawled in cursive (especially when the letters on either side disappear into the athletes’ armpits) and anything with a motto or hashtag written on the leotard. (It’s okay if it’s intentionally a throwback leotard.) Maybe it’s something about growing up in dance instead of a team sport, but I will never understand why people think this is a sane or OK thing to design. It’s endlessly tacky to me. If you want that much school spirit, go buy a pair of fleecey pajama pants or something.